Born at Sanford on 6 September 1892, son of John Cuddy (1843-?) and Elizabeth Arabella Hughes (1852-? ; sister-in-law of Lewis Arnett), brother of W. A. Cuddy, he spent the majority of his life at Sanford. During the First World War, he served overseas with the Canadian Expeditionary Force. On 31 December 1921, he married Mabel Estella Prout and they had three daughters: Embree Emmeline Cuddy (wife of Robert William Law), Nan Cuddy (wife of W. J. Sanderson), and Patricia Cuddy (wife of J. E. A. Wildman). He served as Secretary-Treasurer of the Sanford United Church for 20 years and was a school trustee. He served as President of the Manitoba School Trustees Association for eight years, was a member of the MacFarlane Royal Commission on Education, and was a councillor for the Rural Municipality of Macdonald. 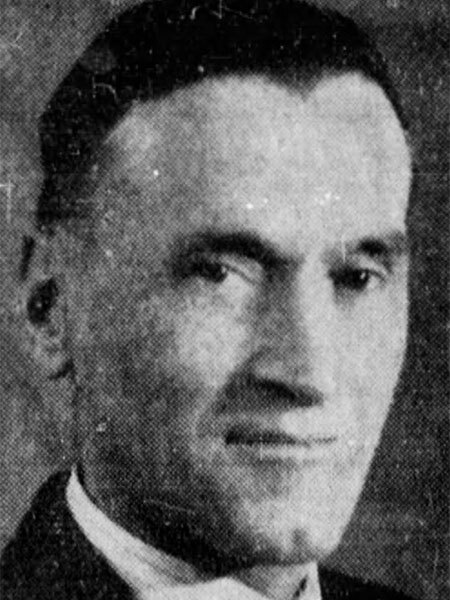 In 1940 and 1945, he was a candidate for the Macdonald constituency in the federal general election but was defeated both times by incumbent W. G. Weir. He received an honorary doctorate from the University of Manitoba in 1952. He died at Penticton, British Columbia on 30 August 1971 and was buried in the Sanford Cemetery. He is commemorated by J. A. Cuddy School in Sanford. Brother-in-law of J. H. Plewes. Obituary, Winnipeg Free Press, 9 March 1945. We thank James Arnett and Nathan Kramer for providing additional information used here.